Will the long-talked about ‘normalization’ of interest rates materialize in 2015? Will Canadian household debt levels eclipse 170% of disposable income? What role, if any, will social media play in lumber distribution? Will $55 oil help or hinder housing starts next year? Who will be the first lumber producer to establish a reload in Cuba? Or will a NAWLA distributor be there first? Will the U.S. market demand for Cuban cigars outstrip demand for legalized marijuana in 2015? Is information technology rendering lumber traders obsolete? Will U.S. politics figure dominantly in lumber trade with Canada in 2015? Will rail rates increase to offset any reduction in fuel surcharges? How will the exponential growth in computer power impact our business in the next 12 months? Is personal integrity in business considered to be less significant, more significant, or about the same as in the past? Will security issues, including concerns over international terrorism, directly impact the lumber business? Where will Interfor stock be priced in 12 months? How many new members will be added to the Billion Board Foot Club next year? Is climate change still mostly about ‘talk’? It seems reasonable that we consider them one at a time. Addressing Number 15 seems timely. Is climate change still mostly about talk? It seems we got the answer to that in today’s Vancouver Sun headline story declaring “Climate deal won’t be binding”. 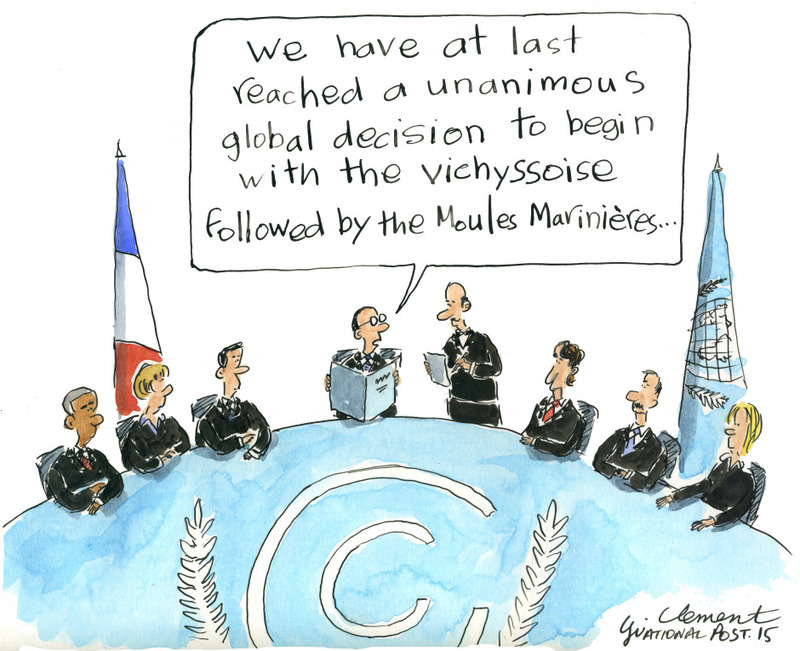 With 190 countries set to open climate change talks in Paris today, we’re told that the climate change agreement hoping to be adopted at the United Nations conference will be “legally binding” but won’t actually force countries to hit their emissions reduction targets. It signals good intentions on many fronts, including note from our freshly-minted Prime Minister Justin Trudeau that “the momentum is shifting toward countries engaging.” And there we have it. The answer to Number 15. This entry was posted in General Interest, Industry. Bookmark the permalink.